Corel WordPerfect Office X6 Standard: Corel WordPerfect Office X6 Standard (WPX6STDENMBAM) is trusted by millions of home and business users as an all-in-one office suite. 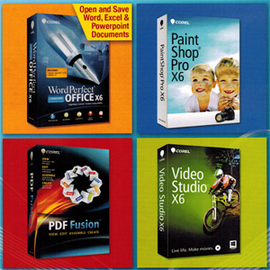 WordPerfect Office X6 continues that tradition, offering the control, compatibility and power you need. Experience unmatched compatibility with support for over 60 file types, including the latest Microsoft Office formats. Enjoy powerful built-in PDF capabilities, collaborate using integrated software and work smarter and faster using all-new features and classic WordPerfect tools. Take control with WordPerfect Office X6 - the legendary office suite designed for today's home and business users. Corel PaintShop Pro X6: Corel PaintShop Pro X6 provides all of the photo editing and creative design tools you need. Manage, adjust and edit your work with a few simple clicks. Create stunning photos with intense visual contrast using new and enhanced HDR features—including the new ability to create HDR-style effects from single RAW photos. Organize your photos and tag people and places using the new Find People and Map View features. Get inspired with creative brush and vector tools, including new text and layer options. Hone your skills with built-in tutorials and use new social media integration to instantly share your creative vision on Facebook, Flickr and Google+. Corel PDF Fusion: Get all the power of the leading PDF solution--without the high price--with new Corel PDF Fusion. Easily create PDFs just by dragging and dropping. Open almost any file--including PDF, graphics and Microsoft Office formats--with support for more than 100 formats. Save files to PDF, XPS and DOC formats to reuse content without starting from scratch. Review and comment for easy collaboration. Plus, edit or add text anywhere in a document, and rearrange, rotate or crop pages with ease. Once you're done, assemble documents in minutes and share them in a single PDF package. Corel VideoStudio X6: Perfect for both beginners and user experienced in video editing, use simple drag-and-drop editing to easily create your own fun and professional looking videos, movies, slideshows and much more.